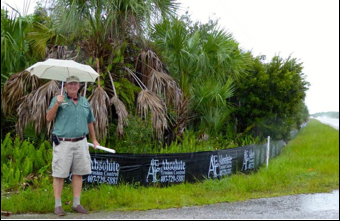 Friends of Fakahatchee Vice President Patrick Higgins checks out the silt fences on the north side of the Tamiami Trail at the Big Cypress Bend Boardwalk. They were installed by the state to prepare for the installation of a deceleration lane that will eventually lead to a new paved parking area. The FOF, working with the Florida Park Service, have developed a multi-year Boardwalk Expansion Project to significantly upgrade the site.